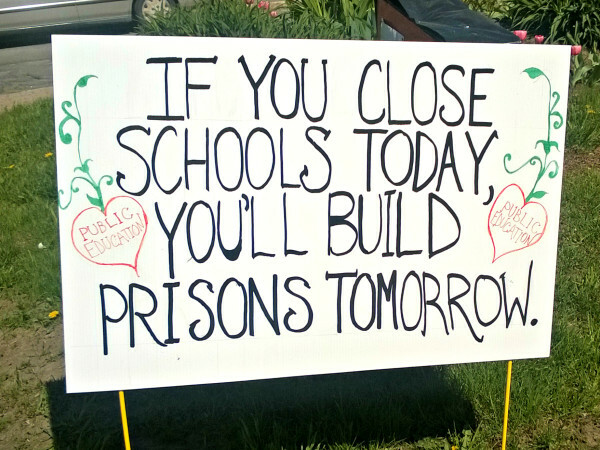 In response to the so-called school budget pig, supporters of the school budget placed their own signs on the right of way between Park Street and Harlow Street near Bangor City Hall, as seen in this May 14, 2015, file photo. PORTLAND, Maine — Credit rating agency Moody’s has maintained a stable outlook on Maine debt but warned that the $6.7 billion state budget is “credit negative” for cities and towns, highlighting cuts in Bangor as an example. “The budget is credit negative for cities, towns and school districts, all of which bear financial responsibility for K-12 education, because they will continue to face a choice between cutting services or increasing local property taxes,” the ratings agency wrote Thursday in its national weekly public sector credit outlook. The ratings agency noted that amid slow economic growth, the state continues to fund education and municipal revenue sharing below levels set out in state law. Voters in 2004 passed a statewide referendum calling for state government to fund 55 percent of the total cost of K-12 public education. The state has never met that mandate. The Moody’s report released Thursday noted state revenue sharing with municipalities, which Gov. Paul LePage’s initial budget proposal sought to eliminate entirely for the second year of the two-year budget, has declined 48 percent from 2009 to 2016. That has contributed to increased budget pressure on municipalities, the ratings agency said, as state law also puts a cap on the amount by which cities or towns can increase local property taxes. Moody’s noted that declaring the budget a “credit negative” for municipalities does not change its debt rating or outlook for specific communities but is a check against one of many credit factors investors would consider in buying municipal bonds. And ratings of that debt are a major factor in how much local or state governments would pay in interest to borrow money. Correction: An earlier version of this story contained an error. The state budget is $6.7 billion, not $6.7 million.